That afternoon was the final reception and award ceremony. After some chatter (and a bit of drinking...), we all received our medals to much whooping and hollering. Then John and Jenny gave out the awards. The overall awards (for closest to their predicted times) went to Page and Roy (or was it Bill? sorry!) We were sitting next to Becky (Roy's wife) when he was announced, and she said, "I don't think he knew that!" Nice! Then the four "special" awards. First came Inspiration, which went to Merle. 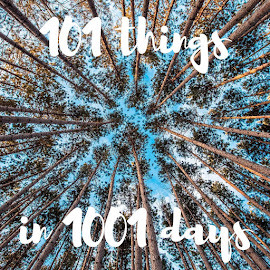 With 104 (109?) marathons under her belt, her years of coaching, and the fact that she really was a pioneer for women's running. She received an enthusiastic standing ovation. Next came Perspiration, when went to Stella. 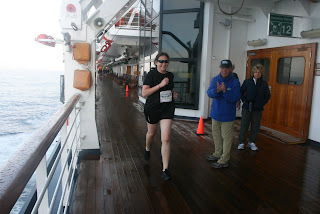 Always energetic, right down to running several extra miles in Ketchikan. Then Dedication, which went to.... WIL! John praised Wil for sticking with it, doing more and more each day despite his burned foot. People laughed and cheered. Mike leapt to his feet and led a standing ovation. Lovely. The final award was for Celebration, which for the first time was awarded to two people: Mike and Corinne, in honor of their engagement at the top of the Perseverance Trail in Juneau. Then we all settled in to watch a slideshow Jenny put together -- so many fantastic photos from our week! We laughed and we cheered and we grinned. Marvellous. All too soon we had to go. We had been asked to go into dinner early so everyone had to hustle. I felt sorry not to be able to say goodbye to more people, but we traipsed off to dinner. We tried unsuccessfully to join John and Jenny for dinner (which we unfortunately never managed! ), but there was no room at their table. Instead we got to sit with some folks he hadn't yet met, so it was still a successful evening. We had decided not to get off the boat in Victoria (we prefer to cross as few borders as possible), so after dinner we went to our cabin to pack. Then we spent the lovely, sunshiny evening wandering around, drinking wine with Bill and Char and then cocktails with the "singlets" in the Crow's Nest. Eventually a group returned from the Victoria pub crawl, and we sat with them, too. All in all, it felt like we spent a little time with a lot of people we liked. We got back to the cabin after midnight, packed a few last things, and then put the bags in the hallway before 1 am. It was raining (of course), and we stood and waited for the bus. And waited. Until a woman came running up and said, "Are you the runners? Follow me!" Turns out that the dispatcher wouldn't let our buses get on the dock, and the drivers couldn't get any closer. 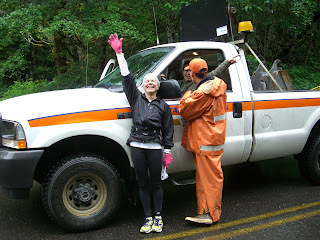 But then we were on the buses and headed out to the Tongass National Forest for the final stage of the race. This leg was organized by the Ketchikan Running and Walking Club -- which has a great logo! We were to run 7 miles in a sort of figure 8 pattern. There was a quick course description, including info on the marking (flour arrows and xs), and then we pretty much lined up to go. I lined up momentarily in front of BJ, saying, "Let me have this for just a second..." and he laughed. I tucked a copy of the map in my pocket and we were off. Wil had been feeling better and better, so we decided to walk it goether. I had something like 1:45 left on my overall predictor time, which is what Wil predicted as our stage time. I predicted 1:50 -- just to give myself something different to aim for. We went a hundred yards or so down a road before turning off onto a trail -- which was really well marked, by the way. Wil kept us moving at a good clip, and we actually passed a few people. Eventually we emerged from the woods and onto a road -- a steep hill -- and laughed that this wasn't exactly the "rolling" course we had been promised. Back into the woods (where we caught up with Don and Joyce all of a sudden) and some more rolling hills. By this point, Annette was close behind us. In a relatively open stretch of the trail, as we walked under some power lines, we came across a big pile of what could only be bear poo. 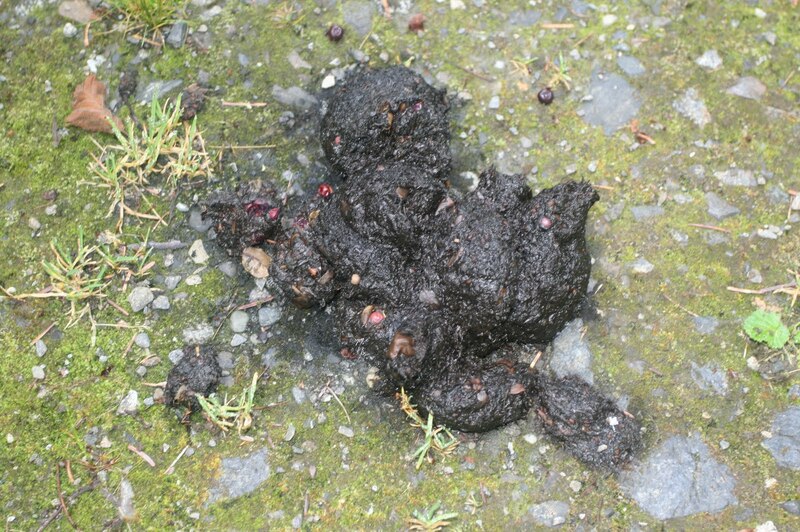 A big steaming pile of bear poo. Annette told us later that spotting the bear poo was enough to make her quicken her pace and catch up with us, and the three of us continued on. 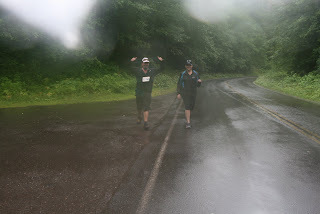 We passed the little water stop, through the tunnel under the road, and then back to the original trail, where we turned back and headed back toward the start. We told her that there were three people behind us, and then moved on around the lake. At some point Wil worked out that we were pretty close to hitting his predicted time of 1:45, but he thought he needed to hustle. He started walking really quickly -- so quickly that Annette and I couldn't keep up by walking. We had to trot and catch up when we fell behind. We saw the three behind us, telling them how close they were to the turnaround, and then headed in. Wil saw, to his horror, that he had mistimed it and walked TOO quickly! He started to walk in slow motion for the last few yards. Everyone laughed, but I pushed him over the finish line. 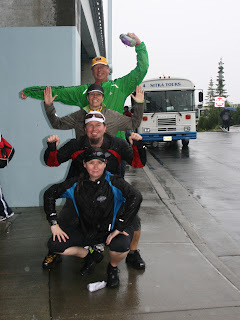 We headed to the shelter to dry off, get warm, and buy some cool KRC gear, and then started to hear the day's stories. Stella had been running not too far behind BJ & company, but then "disappeared". She missed the turnaround and kept running. And running. BJ went out to look for her, but eventually she was picked up something like 5 miles off course by a Forest Service truck. Phew! Two other groups got lost -- I think they may have done a double loop of the first part? -- but eventually all arrived safely. On the bus back into town, John called the Panamanian runners to the front of the bus. It seems that they had been told by the Holland America Line agent in Panama that they wouldn't need a visa for Canada as long as they didn't get off the ship. WRONG. They almost weren't allowed to board in Seattle, but Mila was able to work out a compromise -- as long as they all got off the boat in Ketchikan and flew direct to Seattle. I don't really want to think about the extra expense they must have incurred -- flights to Ketchikan cost over $1000 each -- plus a couple of extra night in hotels, and food... We all felt terrible for them, but were thrilled that John presented them with their medals in a nice little ceremony. Then back into town, where we didn't have all that much time before we sailed. We decided to stay in town and wander around -- we walked along Creek Street (admiring a seal in the water), looked at taxidermy, bought a Christmas ornament, and had a pink of Alaskan Amber at the Fish Pirates Saloon before boarding the ship. Another perfect day. Up early for breakfast, where I ate too much (no surprise!) but such a treat to have room service!!! Our race briefing was at 7, and we were given maps and rules for the stage. See, the Sitka run was an "amazing race", where we had to find locations on a map and then navigate between them in order. And while at each stop, each team had to take a picture and get their bib marked. Once you got back to the start, each person drew a card. The winner of the stage was the person who drew the ace. John told a funny story about Mila -- the previous year, they had done essentially the same thing. John shuffled up the decks (one for men, one for women) and handed them to Mila. Everyone headed out, and when the first runner came in, he drew a card -- the ace. "Wow!" thought John. "But in a random shuffle, the ace *might* have come out on top." A little while later, the first female came in and drew her card -- also an ace. That seemed too much of a coincidence... so he asked her. "How come the first two cards drawn were both aces?" Mila looked puzzled and said, "The winners draw the aces." Ha! There was a lot of chatter in the room -- people had strategies. This made me laugh, a bit. I mean, there weren't even clues to solve, just finding 5 spots on a tourist map and then visiting them in order. And taking pictures while you're at it. We decided to focus on taking funny pictures at each location. We knew we would be the slowest, so we might as well have the best pictures. We rode out on the first tender -- the "love me tender"... -- and were soon in rainy little Sitka. A little chatter, a welcome from the locals, and we were off. We started dead last -- no sense rushing off! -- and headed up and across the bridge. The fast pair were doubling back before we had even crested the darn thing! But we whooped for them all the same. As we did for everyone else -- lots of cheering and whooping. Then back to the road and into the park for stop #4. Along the way we caught up with Mike and Sandy, and joined them for the rest of the run. Then we ran back to the start/finish line, posing for one final team photo. Wet but happy! None of us drew the ace, but we definitely got great photos! 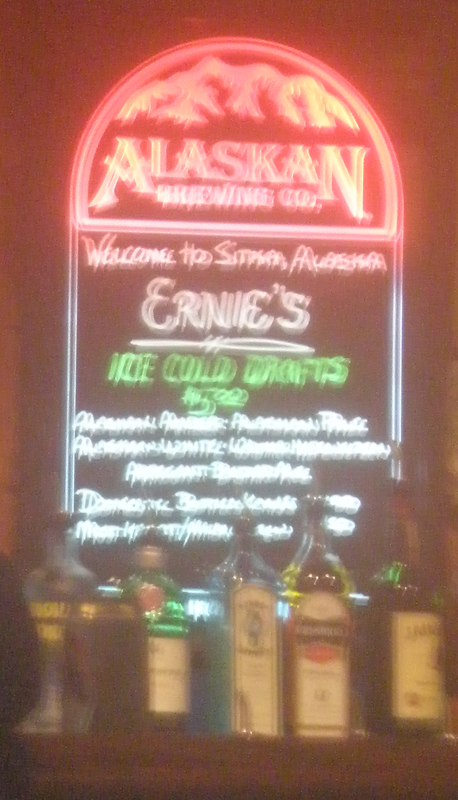 I bought a Sitka High School XC shirt (those poor kids have to fly every time they compete) and then we decided to head back into town to Ernie's, the cute little dive bar we spotted on the way in. We chatted with a couple from Orlando who were also in our group, and then settled in for a nice Alaskan Amber. Since we hadn't had time to have one in Juneau, I figured we at least needed to have one SOMEWHERE in Alaska! I started to get a little cold -- we were wet, after all -- but Wil remembered I had bought a shirt so I changed into it. Then all was toasty and well again. We left Ernie's and wandered the town a little, but our hearts weren't in it. Sitka has some amazing sights -- the Totem Park is amazing -- but it hasn't "cutesied" itself up. Which is probably a good thing. I mean, Sitka just feels like an ordinary small working town... not one that's been tarted up for the tourists. John told us his story about becoming an "adult-onset athlete" -- really lovely. After the session we had a bit of lunch (Why? We weren't even hungry!?!) and then sat in deckchairs as we sailed through Yakatut Bay en route to the Hubbard Glacier. The water turned a milky aqua blue, indicating the presence of glacial silt -- so pretty! The sky stayed overcast, and the temperature grew colder the nearer we got to the glacier. I guess that's how air conditioning works, eh? As we sat there, we saw the little boat come alongside with the naturalist and the native tribesfolk, which prompted us to go hear the ranger talk about the Hubbard Glacier. He showed us some cool pictures and maps, talking about how the Hubbard sometimes blocks the fjord next to it and creates a huge lake. We looked up and noted that hardly anyone was standing up on the balconies on deck 5 and 6, so we hurried to our cabin, bundled up (hooray for down jackets!) and went back outside, finding a perfect spot on deck 6. We're still a mile away from the glacier at this point, which is really hard to believe. The face of the glacier that you can see is 4 miles wide -- it's just impossible to get a sense either how big it was or how far away it was. We kept moving forward slowly toward the active face. The water looked slushy and full of big chunks of floating ice. We found ourselves standing next to a woman who had an uncanny ability to spot the ice just as it cracked, so as we stood and watched we saw a number of large "calves" roll down to the water. Another indication of how far away we still were was how slowly the ice fell. Wil and I stayed on the balcony for hours and hours just watching the glacier. In the end the captain was able to maneuver the Westerdam within 399 yards of the active face -- a new record. Really, really amazing. After a few hours the ship turned to sail out of the bay, but we continued to stand there and watch the ice float past. Eventually, however, we had to get dressed for dinner, where we shared a table with Bobbi and Mary. After dinner we went up to the Crow's Nest, of course. We didn't see anyone we knew, so we just sat down. Eventually Trish and Don joined us, followed by several others, and we had another fun and friendly evening. We had a couple of drinks and then went to bed -- after a promenade, of course. After meeting with our red-vested crew, we boarded a bus and drove to Auke Bay, 20 minutes from the dock. Nick, our driver, told us stories the whole way. Then down the ramp and onto the St. Vincent, our motorized catamaran. A nice crew, and a nicely appointed ship -- lots of binoculars and route maps provided. Wil and I headed upstairs along with a lot of our group and settled in. We sailed to an area where they had spotted whales, and suddenly there were LOTS of whales. The naturalist counted at least 13 of them, all engaged in something called "bubble net feeding", which is a cooperative behavior unique to southeastern Alaska. One whale is the leader and blows a ring of bubbles around a school of herring. The other whales all have jobs, too -- driving the fish into the "net". The herring swim tighter and tighter together, forming a giant "bait ball". At a signal from the lead whale, all of the whales open their mouths wide and zoom up under and through the bait ball, scooping the fish into their mouths. When it's happening, the water looks quiet. Then the birds start circling and then all of a sudden there is a circle of huge black, gaping mouths. Amazing! We watched them do it twice, setting up catches over 15 to 20 minutes. Meanwhile a baby whale, possibly bored by the grown-ups' working, was playing around, leaping out of the water and frolicking. After watching two cycles, we turned to go (I believe there are limits to how long boats are allowed to be near whales, perhaps?). But while we were moving, we noticed that the birds started going nuts not far from us. The captain cut the engines and then all of a sudden there was a whale feeding frenzy, all around our ship. AMAZING! Everyone went nuts. I believe I was one of many who shrieked "Oh yes!" at one point. Nuts. The naturalist and crew were saying that it was one of the best sightings they had had all season, and that often they just spot a whale swimming alongside, and that that was "enough". We sailed around for a little while, spotting a bald eagle and some catatonic stellar sea lions on a buoy. Then eventually we headed back (spotting one whale swimming alone, which attracted very little interest from our jaded gang), and bussed back to the ship. I did manage to pick up a newspaper to dry out our shoes, but no other souvenirs. While waiting to go up the gangplank I had my Achilles tendon clipped by a lady pushing a wheelchair -- luckily only bruised. And then we were on board. We had a late dinner that night at Canaletto -- a tiny sliver carved out of the Lido buffet, but turned into a fine Italian restaurant. I was starving, having had only 4 pieces of sushi, a handful of tortilla chips, and 2 granola bars since 8am. No, wait, on our evening whale watching cruise I enjoyed a selection of fine desserts and appetizers! Three donut holes and a ritz cracker with a bit of smoked salmon on it. Still, I was STARVING, so we ate like pigs. Tons of delicious bread, grilled veggie antipasti, a seafood soup, potentially a salad? And I had amazingly perfect seafood fetuccini alfredo. Gorgeous. And, yes, we had dessert -- a trio of tiny, creamy tiramisu in different flavors. YUM. Waddled back to the room and collapsed. A fine, fine day! 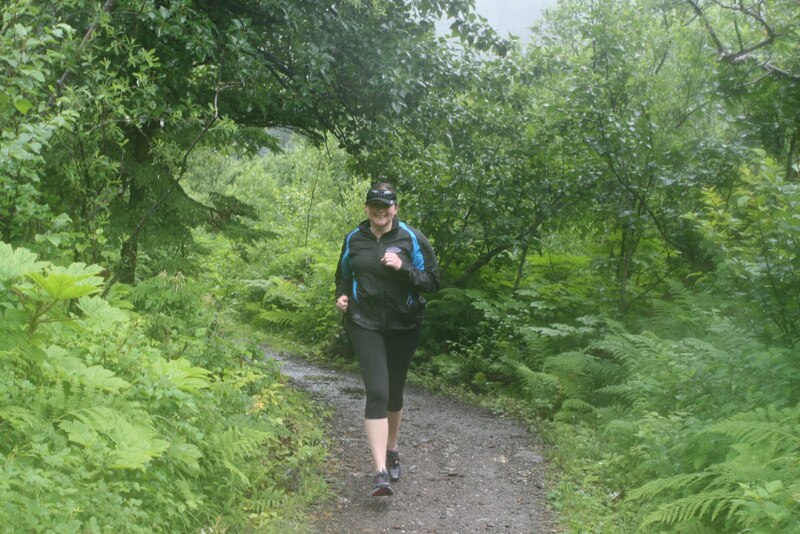 Today was the long stage -- the 10-mile trail run in Juneau. I was both nervous and excited about this. It was kinda funny -- there were lots of questions such as "are there toilets?" Reply: "There are boy trees and girl trees." After the briefing we went back to the cabin to lay out our gear. I decided on capris, the HVAC top, and my Rock 'n' Roll jacket to run in. We also packed a bag with the stuff we wanted for the whale watching excursion that night -- in case we didn't get back to the ship before we had to meet for the trip. We gathered in the hallway outside of the Queens Lounge -- a sort of organized chaos -- and waited a long time. It got hot, people got woozy and grumpy, and I have never been quite so glad to walk down a gangplank and onto a dock! We walked a couple of blocks to the start -- including a very steep and long flight of stairs. We stowed our gear in the running club garage (at which point I discovered that my camera battery was dead, awesome...), got a very brief course description from the organizers, and then, with a whoosh, we were off. We all ran down a hill, then up, up, up a steep hill. I was feeling a bit nervous, honestly worried that I would finish last, and having some trouble breathing in the cold, wet air. So I decided to just walk up the hills. Every so often I would run a little, but the walking just made better sense. 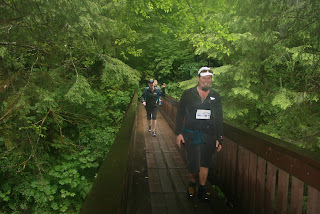 My favorite part of the beginning of this course was the big wooden bridge up to the trailhead. Very cool. At some point Mike caught up with me, grabbed my hand, and said, "C'mon Sunny, we're walking up together. "So I hustled to keep up with his super long legs as we walked at a really good clip. 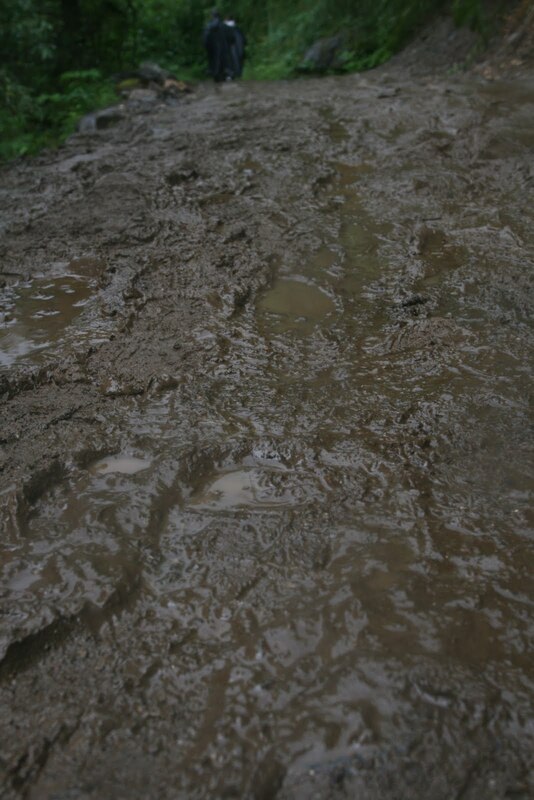 The trail was lovely, if very muddy and wet, and we just kept climbing. 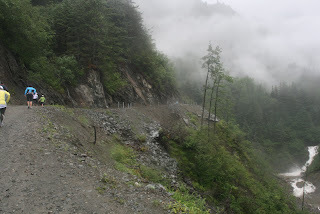 One section had a steep cliff, with a wire railing to keep you from wandering off it. A lot of us pretty much hugged the opposite wall on that part. We grabbed some water from the water stop there and just kept going. Jenny joined us for a bit before bounding ahead to take photos. It wasn't all that long before the leaders -- the fast dad, one of the local high school kids, and then BJ came speeding down the trail. Mike and I cheered for them, getting no response from fast dad, a bewildered, panicked response from school kid, and a smile and whoop from BJ. I will say that, a few moments later, when fast daughter appeared, she responded with "great job, guys! ", which made me very happy. As we got closer to the top, more and more folks passed us and almost everyone engaged in mutual cheering. I won't name the one person who failed to cheer, however... Great to have so much camaraderie! Then off I went -- a bit nervous about running on a trail, but excited too. As I ran, I was surprised to come across other people still heading up -- I thought we were the end?!? -- and then a long string of walkers. I cheered for them and told them they were very close to the turnaround, which made them all happy. Then I ran some more, meeting Jenny on her way up. She snapped a picture and said, "Brochure cover!" and I laughed. Then down, down, down. I took a few walk breaks, managed to jam my right ankle once, and pass a few folks. I also walked any time there were railings. I could just imagine clumsy me tripping and launching myself over them! By the time I reached the trail head I was pretty tired and pretty amused by my time. I had predicted either 2:15 or 2:30, and it hadn't even quite been 2 hours yet. The hill was too steep for me to run down, or, hell, UP, so I walked. As I crested the final hill, however, I broke into a trot and arrived to cheers. Wil was serving as race photographer, which was lovely. Wil had walked a mile or so out along the trail with a couple of folks, and then sat for a bit before heading back. The duct tape cover worked semi-well, but it started to flap off when it got too wet. When he got back he considered going back to the ship, but John deputized him to take photos, so he said he suddenly felt engaged and happy to be out there. Nice. :) And I was sure happy to see him. 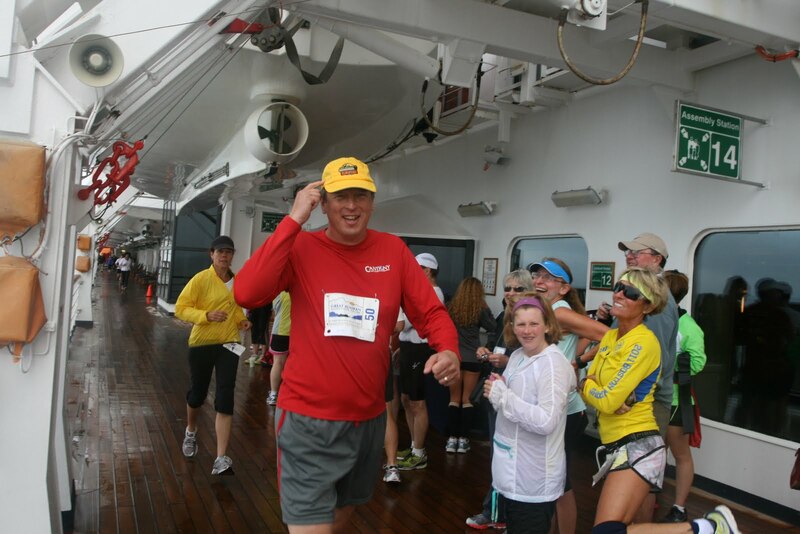 Sunday was stage 1 of the "marathon" -- a three-mile deck run. Before leaving for the trip my colleagues and I estimated how many laps that would be -- 15? 21? More? 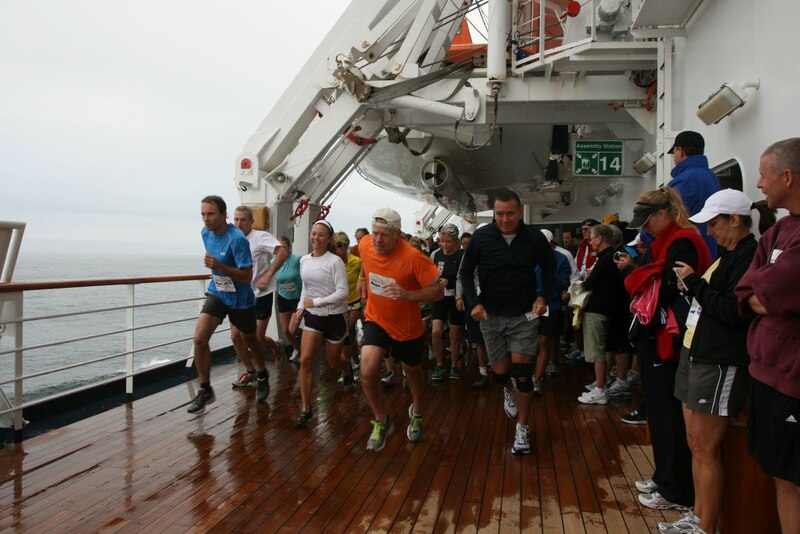 But I was astounded to learn that a mile is a mere three laps around the promenade deck. That's one big boat. We met in the Queen's Lounge for breakfast and a pre-race briefing -- part info, part pep talk -- and John and Jenny explained the rules and described the different stages. See, rather than just have each race be "won" by the fastest runners, each race had a different challenge. Stage 1 was a predictor race -- whoever was closest to their time won the stage. 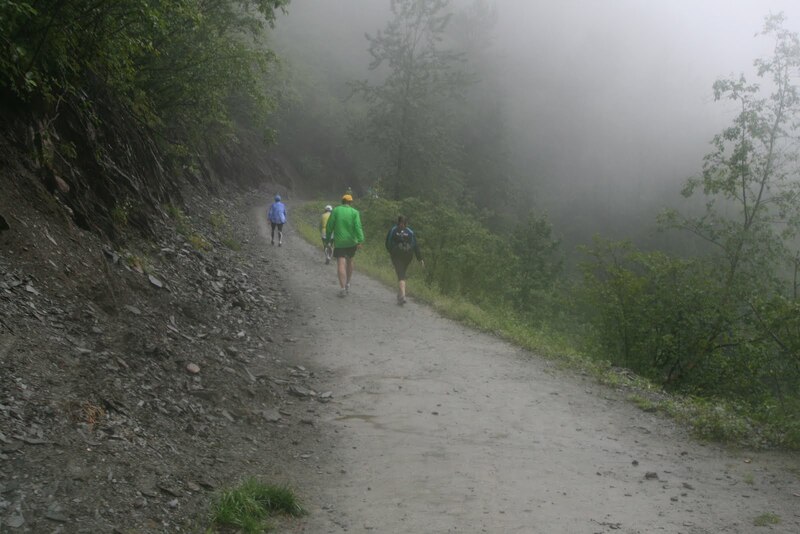 Stage 2, a trail run in Juneau, was a standard, first to the finish race. 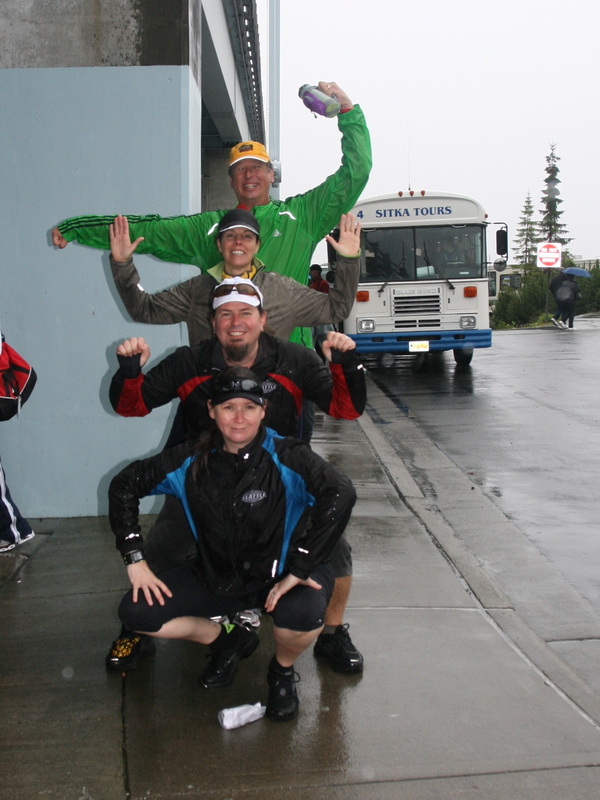 Stage 3, an "amazing race" in Sitka, would be determined by the people who drew the aces at the finish line. 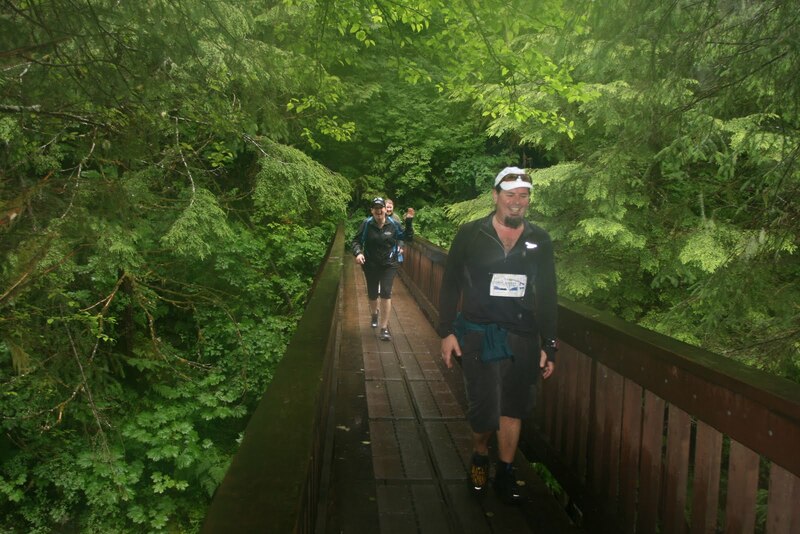 And Stage 4, a trail run in Ketchikan, was another predictor race. Finally, the overall winners would be the people who came closest to their predicted combined time. Very cool. Then we were asked to submit our predictions for the first stage. I predicted a gentle, slowish 35 minutes. The catch? No watches or training devices of any sort on the first run. 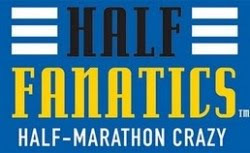 We also submitted our predictions for the overall race -- I went very conservative, knowing that I would be walking at least two of the stages with Wil, and predicted a gentle 6:02. We buddied up to time each other, and the first wave got to the starting line. Wil went first, given that he was going to be walking the whole thing. Everyone set off running while the timers stood and cheered. The fast family were impressive to watch, running six-minute miles and finishing under 19 minutes. But I was sad to see that when they finished running, they seemed to turn in their times and leave. 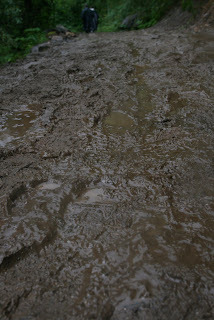 So much for the camaraderie of runners! Everyone else stayed and switched places; the timers becoming runners and vice versa. There was a lot of nice support, lots of whooping and hollering. I stood with Mike and Dan, and Wil got extra big cheers each time he passed. When he finished, in 46:31, we swapped places and I stripped down to shorts and a top and headed out. I was the last to start, so I probably took off a little too fast. I ran the first mile flat out and started to feel a little sick -- not sure if it was too much breakfast or just the fact that every time we ran around the bow of the ship if was lurching a little. I worked out that I could run the long long straightaways and walk the tight turns and get through it okay. All of the runners had to do a bit of dodging -- lots of other promenaders -- but people were friendly and for the most part quick to get out of the way -- except at the end of my 8th lap, when I had to weave through a bunch of my fellow runners! Nice that a bunch of people waited for me to finish and cheered me on before going in. Sure, a bunch of people were gone, but not everyone. Nice memories from the run: Lynn taking off an item of clothing each time she came around. She got down to just her jog bra and capris and we were wondering what on earth she might take off next. Bill just kept collecting her gear, and had quite a pile of it by the end. Lynn shouting at Bill to stop running because of his hurt knee. The lady on the deck chair on the starboard side, telling me that I was on my last lap. Mike, a fast walker, telling me I needed to stop lapping him, and telling people that he was going to get the yellow cap. My time? 31:10; fastish for me. I was pleased to have "banked" a little time for later, since I was kinda dreading the trail run. Then back to the room where I showered (I was really sweaty!) and then we hustled up to Jenny's talk about exercise and stretching. We were in the Crows Nest again; a little weird to be sitting on towels and essentially just watching her. I guess no one wanted to be the first to actually do the exercises. I wonder what Jenny thought? Still, it was nice to chill out as a group. The rest of the day was all ours. Wil and I had a pre-lunch cocktail and then went up to the Vista Dining Room for lunch. 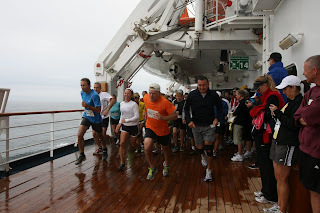 We sat at a table against the stern windows with two couples -- one from California, one from Oregon -- who were ver nice and asked lots of questions about the runs. It was clear that the red vests were already making an impression on the general passengers. At first no one joined us at our table -- but then Ann and Barbara from Chicago sat down. (Our 5th and 6th never made it... we were losing a companion each meal!) Ann had had a good run in the morning, nice and steady. 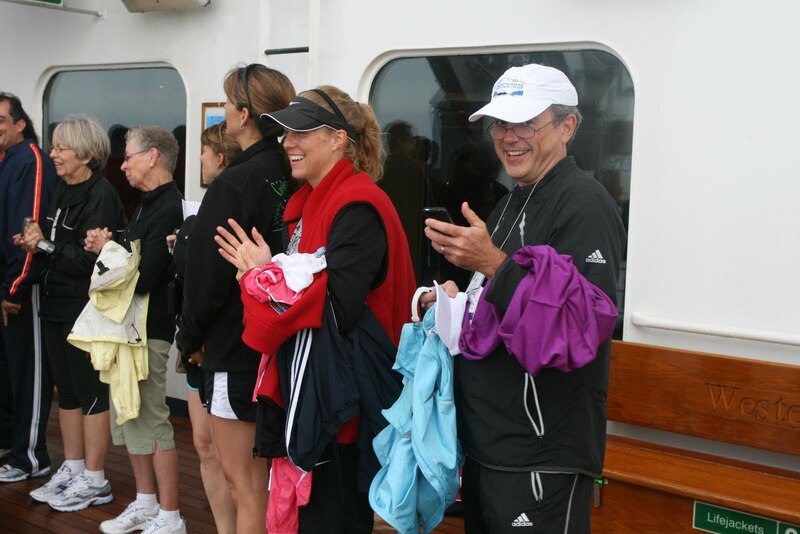 Barbara, her cousin, was an enthusiastic supporter along for the cruise. Very nice. After dinner we went up to the Crows Nest for happy hour -- and found Jenny sitting on her own. We joined her, and then John arrived. We talked business for a bit -- but then he bought us a round of drinks and we went back to socializing. More and more folks joined us -- BJ, a meteorologist, ex Air Force, and super fast runner; Page, who I had been calling "Lulu" in my mind because she wore lots of Lululemon gear; Kelsey, Page's daughter; and others. It still delights me that most people -- really almost everyone -- was super friendly. Wil and I had planned on seeing the 8:00 show, but then we were enjoying ourselves so much that we hung out in the Crows Next for another hour or so. Good company, good evening. We told him we were going to the show and he said, "Oh... I saw it at 8..." and gave it a decidedly poor review that started with "I don't want to prejudice you, but...". I said, "But they're up there, singing and dancing their hearts out, right?" "Well, they're up there..."
Still, we toddled along, had some of the captain's free champagne, and made it through about 20 minutes of the show before fleeing. Decidedly mediocre, and hardly anyone was there, which felt sad. 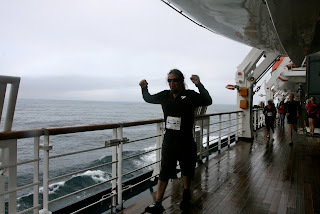 We slipped out after the can-can number, did a loop of the promenade deck -- much emptier at night! -- and then bed. "Pardon me! On your right!"